The Hailey City Council will hold a public hearing at 4:30 p.m. today, Oct. 9, at City Hall to introduce three finalists in the hiring process for a new fire chief. The council will then convene in an executive session to discuss their decision. - Craig Aberbach, of Cape Coral, Fla., with 24 years of fire rescue, emergency management and administrative leadership experience. 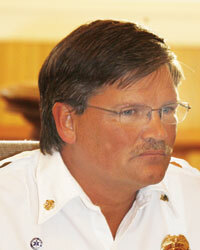 He has served as division chief, battalion chief and captain of special operations. He holds a master’s degree in management and an AA Degree in Fire Science. He served as a course designer and instructor at Florida State Fire College and various fire academies and conferences. Working as the director at Edison State College, his responsibilities included Fire Academy oversight, EMT and paramedic programs, and both Fire and EMS classes and associated degrees. He was honored as the State of Florida Fire Service Instructor of the Year in 2000. - Brady Austin, of Rigby, Idaho, has 21 years of experience and currently serves as battalion chief for one of the largest fire departments in the state. He has also served on volunteer fire departments in his various home communities. He has crisis- and risk-management skills; operations leadership; labor, budgeting and special rescue experience, including hazardous materials response, confined-space rescues, and work on wildland or wildland/urban interface fires. He is working to obtain a bachelor of science degree in fire service administration coupled with a major/minor in political science from Idaho State University, and serves as an instructor/evaluator for the Idaho Division of Professional-Technical Emergency Services, through which he instructs state-approved courses to various fire departments. He also teaches approved courses and assists in drill and exercise design for the Idaho Bureau of Homeland Security. - Mark Meaker, of Logan, Utah, has 39 years of experience, including 13 combined years as fire chief for two cities in Utah and California. He holds a certified chief officer designation from the state of California. He has worked in a variety of combination volunteer and paid departments, as well as full-career departments of all sizes. He promoted countywide cooperative agreements in the areas of regional fire training, a regional fire public education consortium, and developed a countywide joint special operations organization that operates technical rescue and hazardous materials teams. He holds a master’s degree in public administration, a bachelor of arts in journalism and communications, and an AA Degree in Fire Technology. He has received numerous awards, including the Elk Grove Man of the Year Award from Elk Grove, Calif. In addition to the public introduction today, the three finalists will meet and converse with the Hailey Volunteer Fire Association, interview with the Hailey City Council, interview with other Hailey city department heads who interface daily with the fire chief, and hold private interviews with Mayor Fritz Haemmerle.